Burgers are one of the easiest and fastest meal you can make. These open faced chicken curry burgers are a delicious departure from the old classic. 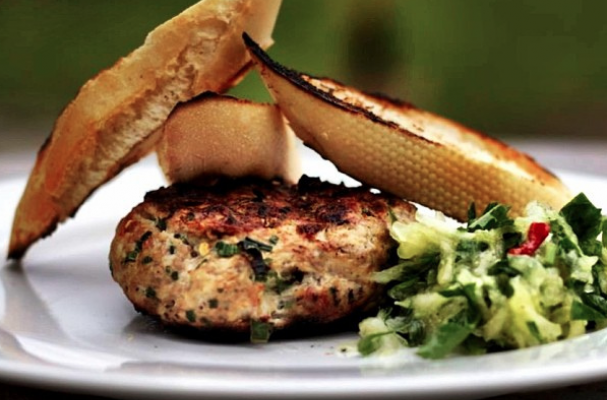 Ground chicken is seasoned with aromatics including ginger, garlic, cilantro, and hot sauce. You can top your burger with your favorite ingredients but I like to keep things simple so you can taste all the flavors in the patty. Mango adds a touch of sweetness but does not over power the patty and lettuce and tomato add crunch and freshness. Step 1: In a large bowl, mix the ground chicken with green onions, garlic, fresh chopped cilantro, ginger, red bell pepper, sriracha and curry powder until well combined. Be careful to not over work the mixture or else the burgers will be tough. Step 2: Form the chicken mixture into 6 patties. Drizzle each patty with a little canola oil. Preheat griddle or grill pan over medium heat and add the patties. Make a small indentation with your thumb in the middle of the patty. Cook burgers for 5 to 7 minutes per side until cooked through. Step 3: Top each bun half or bread slice with a patty and then proceed with lettuce, tomato and chutney. Serve immediately with a pickled cucumber salad.